Three generations of men—a storyteller, his father and his son—encompass this book’s world. . . . it is a world of historical confusion, illusion, and hope of three generations of Belgraders. 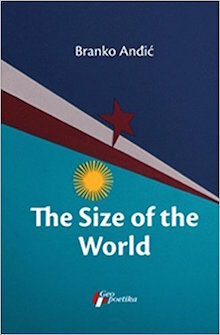 The first and last sentences of the first chapter of The Size of the World give the reader the characters, setting, and central metaphor of Branko Anđić’s novel. It is a metaphor that is used throughout the book, sometimes well, though at other times tortured and stretched. It is definitely recommended that one makes peace with the idea of the world having different sizes because it is used, a lot. Part of the Serbian Prose in Translation Series from Geopoetika, the book is translated by Elizabeth Salmore and consists of sixteen chapters, all of which are told from the point of view of the protagonist/narrator, unnamed but presumed to be Anđić himself. Each chapter is written with a theme in mind and whilst Anđić will explore the theme itself as a concept, they mostly serve as starting points for childhood anecdotes involving his now-deceased father and the examination of these events from the perspective of the narrator as an adult. These are interspersed with experiences of the narrator with his own son, which serve as both comparisons and contrasts to those memories of his father. Due to the focus of the writing moving from commentary to personal retrospection in pretty much every chapter, the narrative jumps around a lot chronologically-speaking; likewise, the setting of the book shifts between the narrator’s childhood home in Belgrade and his current residence of Buenos Aires, Argentina. Most of the narrator’s stories involving his father are based in either Belgrade or holiday locations within striking distance such as Budva, whereas, the times spent with his son are usually in South American locations such as Quilmes or Bahia. Although there are a few chapters that contain both stories involving the narrator’s father and son, usually they are given their own chapter as a platform. In the first half of the book, the focus of the chapters alternates pretty evenly, but in the second half, there is more of a focus on the relationship with the father, particularly as his diabetes worsens. Although dealing with other themes, the backbone of the book is the relationship between the maybe-Anđić and his father. Despite the storytelling being rather simple at times, the memories that are presented in Anđić’s writing are well selected and paint a complex but believable picture of the father. Even though he is retelling these stories as an adult, Anđić manages to capture images of his father that are appropriate to the time, with the earliest memories being those of a hero-type character who is strong, nubile, and can do anything. bq. I took in his strong, tanned neck, muscular arms, full moustache and thick, wavy hair, and longed to one day be just like him—an intrepid saviour of the weak and powerless, a decisive man who took his family on vacation to someplace called Budva. Starting off with the childlike view of the parent as being an omnipotent, flawless character, Anđić deals with the consequent realizations of his father’s imperfections and limitations. The events that depict these realizations are excellently written and maintain the essence of disappointment that Anđić felt at the time, despite being retold as an adult. Indeed, even as an adult, Anđić manages to retain something of the spoilt brat about him. The first of these events is Anđić’s finding of a savings book containing a vast sum of money, only to realize that it is not real. Even though not an entirely realistic thing to do itself, this is just the first example of how his father would use dream and exaggeration to distract himself and his family from the newfound limitations caused by Yugoslavia’s nationalism of private businesses and his family’s subsequent loss of their middle-class status. He wanted me to have a better life, not through finding fault with our real one, but by cloaking it with an unflaggingly desperate optimism which he utilised, day and night, to build a tower in the sky. There are, of course, further disappointments for the young Anđić as he grows up and realizes that his father is limited (or has a “smaller world,” to use Anđić’s increasingly toe-curling phrase). Be it his father’s inability to buy him the wooden cat and mouse toy that he wanted or the fact that his father could happily sit and watch a television with no picture for a week, it is clear that Anđić is set for bigger and better things. Leaving his father, his country, and his continent behind him, he sets off for South America for a world of fine art, music, and trips to unfrequented places in the mountains. Obviously, leaving continental Europe was necessary for such things, but nonetheless, from his newfound perspective, themes of travel, emigration, and, indeed, home are explored. Anđić’s relationship with his own son, and the fact that they have to maintain contact over two continents whilst Anđić enjoys the finest things that South America has to offer, helps him to consider the different ways that fathers and sons can have their worlds overlap, be it through wine, sports or music. Through Skype or infrequent visits, their relationship develops and it is through his analysis of this relationship that Anđić starts to see his own father as more than a yarn-spinning, afraid-of-the-world dreamer, and gives him the chance to see him once again, as “the Danube Penguin”, a heroic swimmer at the resort of Budva who “caught thieves, defended women from would-be seducers, and established order.” As the father’s life nears its end, as an old man hiding his catheter from his son, he takes a final, perfect dive from the high board—and his son’s response, “Straight as an arrow, like always,” is poignant. Anđić’s and his father’s relationship has come full circle, but on terms that allow them to move forward with each other rather than being forced out of each other’s lives. At that moment, in addition to being his son, I also became a parent to my father. But the outcome of that dive was that it managed at the eleventh hour, in the last moment of our lives when it still wasn’t too late, to reconcile the truth with his story. Putting it more simply, one either imagines the world or gets to know it, but always one or the other and never both.